Who’s on the Senate Intel panel questioning Comey? WASHINGTON — Former FBI Director James Comey won’t be the only one in the spotlight Thursday as he testifies at a wildly anticipated hearing. 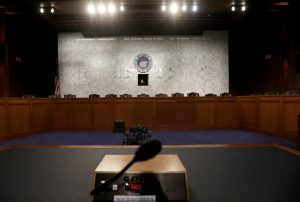 The eight Republicans and seven Democrats on the Senate Intelligence committee each get their moments as they take turns questioning the former FBI chief who was fired last month by President Donald Trump. The panel’s members represent right, left and center of the political spectrum, including liberal Democrats who’ve attacked Trump relentlessly, and conservative Republicans who’ve defended him unreservedly. There are potential presidential candidates past and future, senators up for re-election in a tough political climate and a couple veteran GOP lawmakers, including committee Chairman Richard Burr of North Carolina, who were re-elected last year against the odds, thanks partly to Trump’s own victory. Each lawmaker will be guided by his or her own political considerations as well as constituent orientation as they question Comey, mindful of the glare of the national spotlight. Here’s a look at four lawmakers representing a range of views on the committee. Comey’s testimony is scheduled to begin at 10 a.m. ET June 8. Watch live in the player above or on your local PBS station. Lankford, 49, is serving his first full term in the Senate after four years in the House. Before that, he worked for the Baptist Convention of Oklahoma as director of student ministry. Despite his conservative orientation and general support for Trump and the GOP agenda, Lankford has on occasion separated himself from the president, including calling for him to release his tax returns. With the release of Comey’s written testimony Wednesday, the Republican National Committee focused on the confirmation it provided that Comey had assured Trump he was not under investigation. Lankford expressed hope for an open discussion with Comey. Collins, 64, is one of the leading centrists in the Senate, the Republican who’s often most willing to break with her party. For example, she opposed a couple of Trump’s Cabinet nominees. She did not support Trump for president, and although unfailingly gentle and polite she has not been shy about voicing her criticism of him. Collins spent years working for her predecessor in the Senate, Republican William Cohen, and was interning for him in 1974 when he voted as a member of the Judiciary Committee to impeach President Richard Nixon. Very popular at home, Collins was easily re-elected to a fourth term in 2014 and is now viewed as a potential candidate for governor. Collins is interested in hearing directly from Comey about his interactions with Trump prior to Comey’s firing. The ousted FBI director said Trump sought his “loyalty” and asked what could be done to “lift the cloud” of investigation shadowing his White House, according to prepared remarks released ahead of his appearance Thursday. Manchin, 69, a popular former governor of West Virginia, is the most conservative Democrat in the Senate and is running for his third term in a state Trump won by 40 percentage points. Manchin has not been afraid to praise Trump, meet with him and align himself with the president. At the same time, he’s stuck with fellow Democrats in strongly opposing Trump on some issues, including the GOP drive to repeal and replace former President Barack Obama’s health care law. Now, approaching Thursday’s hearing, Manchin says that West Virginia voters are closely following the story line around Trump’s firing of Comey and the federal investigation into Russia’s interference into the 2016 election and ties with Trump. He asked constituents to send in questions they wanted to make sure got asked at the hearing, and received over 600 responses, which his staff is breaking into categories to help guide his questioning. Harris, 52, is a newcomer to the Senate, but not to the role of questioning witnesses. She spent years as a prosecutor, and served as district attorney of San Francisco before being elected California’s attorney general. She was elected to the Senate last year to replace another liberal Democrat, Barbara Boxer, who retired. Harris drew attention at Wednesday’s Intelligence Committee hearing when Burr cut her off as she pressed a witness, leading to complaints from liberal and women’s groups about her treatment. A rising star in California politics, she is also seen as a potential future candidate for president. Harris has been among the Democrats most steadfastly opposed to the Trump administration. Harris has said she hopes to use Thursday’s hearing to press Comey on the investigation into Russia’s election meddling that he was overseeing before his firing.